Guest Fern Britton with the 2016 RoNA Award winners and Outstanding Achievement recipients. Iona Grey triumphed over fellow competing authors to win the Romantic Novelists’ Association’s highest accolade, The Goldsboro Books Romantic Novel of the Year, with Letters to the Lost, published by Simon & Schuster. Fern Britton presented Iona with her trophies and a cheque for £5000 at a star-studded event, compèred by Jane Wenham-Jones. Iona Grey was the winner of the Historical Romance Novel of the Year category. Her book then went forward, along with those of the five other category winners – Contemporary, Epic, Romantic Comedy, RoNA Rose and Young Adult – to contest the Romantic Novelists’ Association’s (RNA) most coveted award, the Goldsboro Books Romantic Novel of the Year. A panel of independent judges read the six category winners’ novels before meeting to debate the finer points of each book. The panel included Matt Bates of WHSmith Travel; Sarah Broadhurst, formerly The Bookseller; novelist Elizabeth Buchan; Dorothy Burrows, Programme Director of the Wantage Literary Festival; Alison Flood, Guardian.co.uk; and Karin Stoecker, ex-Editorial Director, Harlequin Books. Prior to announcing the overall award winner, Fern Britton revealed the winners of the individual categories and presented them with star-shaped crystal trophies. Anita Burgh is the author of twenty three novels, all published after she reached 50. Claire Lorrimer, who has written more than 100 novels, is the daughter of the RNA’s first President, best-selling novelist Denise Robins. 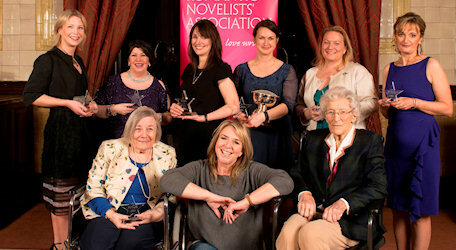 Both Anita and Claire were presented with outstanding achievement awards for their continued championing of the RNA and romantic fiction. 2016 Romantic Novel of the Year Awards- the shortlists2016 contenders for the Joan Hessayon Award for new writers.